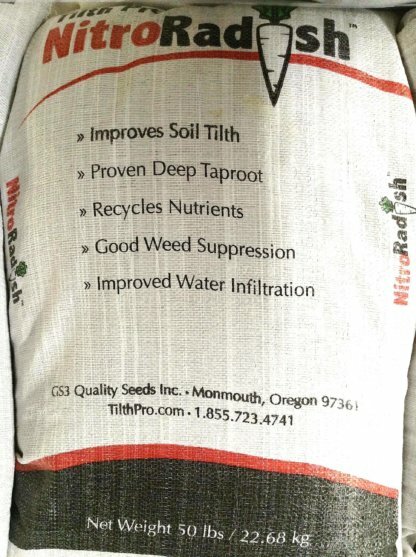 Tilth Pro NitroRadish is an Oregon grown Daikon Radish used for fall/winter cover crop. It provides many helpful benefits to the grower, the soil, and the environment. It germinates and grows quickly; has a large, deep penetrating tap root; dies over the winter (in cold climates); decomposes quickly; has high nutrient content, and contains bio-active plant chemicals. It has the ability to recycle nutrients which will improve your soil quality and economic crop production. Radishes establish very quickly, providing good ground cover, smothering weeds and preventing erosion. The tap root drives deep into the soil, pulling up nutrients otherwise unavailable to the shallower rooted crops. These tap roots provide a way for air, water and crop roots to penetrate deeply into the soil. The NitroRadish root can grow to depths of more than 30 inches deep allowing the roots to reach water and nutrients in the subsoil. NitroRadish performs well under drought conditions. The large taproot helps to break-up the compacted soil layers. Over the winter, the taproots break down, leaving holes in the ground that assist in water infiltration and rooting of the next crop. These roots also reach deep into the soil profile and gather “leftover, unused, residual” nutrients and bring them to the surface to be used by the next cash crop. 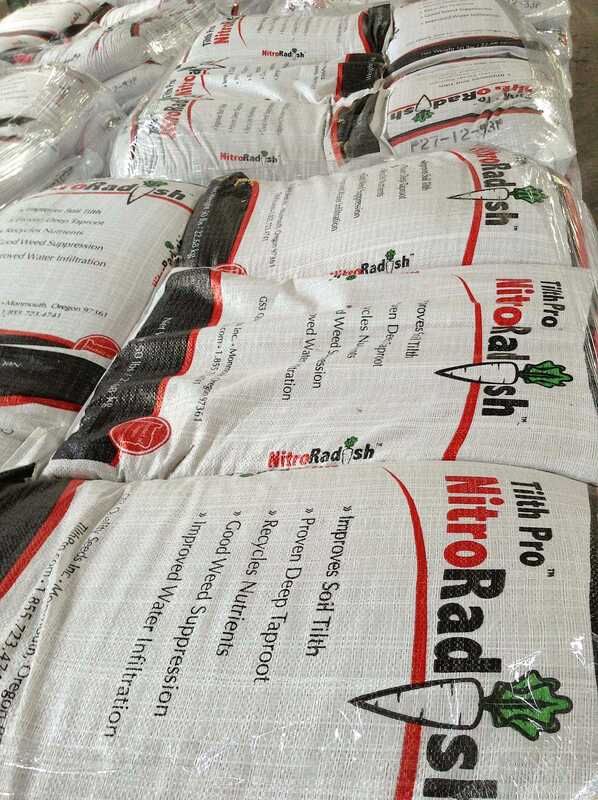 With its fast-growing ability, the biomass of the NitroRadish recycles the excess soil nutrients. The NitroRadish will easily decompose, leaving the soil rich in nutrients, and increasing your soils organic matter levels. These nutrients are beneficial to your spring crop. The recycled nutrients provide a rich soil and also reduces the amount of fertilizer needed to grow the next crop. With its rapid germination and growth NitroRadish will suppress weeds which will help save on herbicides and cultivation. With its vigorous growth, NitroRadish out competes the weeds for space, light, nutrients and moisture, suppressing weed growth. The roots of the NitroRadish will leave behind large holes in the soil, leaving an opening in the soil allowing rainwater to easily soak in. Also, this aerated soil warms up quicker in the spring creating better conditions for planting. Excess nutrients in manure amended soil are rapidly absorbed by this cover crop, thus preventing leaching or runoff of nutrients into watersheds. Seed 8-10 lbs/A straight or 2-4 lbs/A in mixes. Drill in rows 6-8 inches apart, 1/4 to 1/2 inch deep. 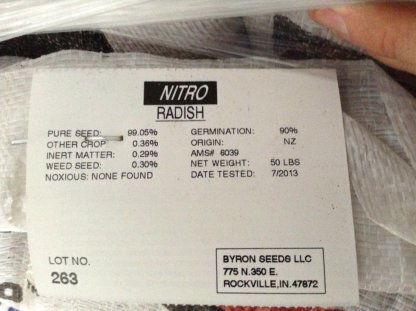 Radishes can be broadcast and rolled with a cultipacker or aerial seeded into drying corn. Use higher rates for broadcasting and aerial seeding. Radishes can be no-tilled into grass if the grass has been grazed or mowed very close. Fall planted radishes are great for sequestering residual nutrients from the previous crop. Avoid planting in low spots that collect water. Daikon radish is tolerant of frost until temperatures dip below 25 oF. It takes several nights of temperatures in the low 20’s oF to kill Daikon radish. Radishes can be planted into existing crops at the beginning of leaf wilt, either by aerial application or by a high boy rigged with a broadcast system. They work well in mixes or can be seeded alone. In mixes, 2 or 3 lbs is all that’s needed. Radishes winter kill when temperatures reach 23 degrees. NitroRadish is ideal for planting in the late summer or early fall. Significant amounts of Nitrogen can be captured by this cover crop when planted 30 to 60 days before the first killing frost. NitroRadish can work very well in a blend with other cover crops. NitroRadish is fast growing, cool season cover crop. It winter-kills, it does not need to be killed or incorporated to prepare a spring seedbed (in cold climates).